One Loaf of French Bread - Recipe #2! In your bowl, put put 3/4 C warm water. - Gradually sprinkle yeast over surface wetting each pellet. Add 1 1/2 Cups flour to the mixture and mix in using the wooden spoon. Add flour, 1/4 cup at a time, using your hands once the dough becomes too stiff for the spoon. Add only enough flour so the dough no longer sticks to your hands. (The amount you use will depend upon the kind/quality of flour, elevation, humidity in the air and other factors). Turn dough onto a floured work surface and (LET THE DOUGH REST FOR 10 MINUTES). Knead until the dough is smooth and silky and is feels alive (is responsive) under the hands (7 to 10 minutes). Rub vegetable oil (or the fat of your choice) onto the surface of the dough. Return the dough to the mixing bowl and cover with a plastic or wax paper sheet or with a pot lid. Place in a warm, draft free place to rise until double in bulk (approx. 75 minutes). When doubled in bulk, turn dough out onto lightly floured surface. Press bubbles out of dough (punch down dough). 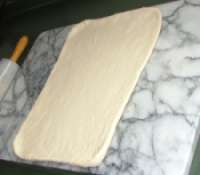 Roll the doughout into a rectangle - approximately 16" x 10" (41 cm x 25 cm). Cover the loaf, loosely, with a sheet of waxed paper and place in a warm, draft free spot to rise (approx 50 mins.). Slash the loaf across the top (3 slashes looks nice). Coat the loaves with the egg white beaten with a little water. (Optionally - then sprinkle loaves with coarse salt). At 25 minutes remove the pan of water and lower the heat of the oven to 350ºF (176ºC), turn the loaves and bake for an additional 15 minutes or until done. With just a little dairy in its makeup this recipe makes one, 16" (37 cm) loaf. This recipe can easily be adjusted (cut, shaped and baked) to make beautiful French Rolls instead of a baguette or other loaf.